One of the most powerful reflections exercise I’ve ever done is called a Life Map. I see it as a helpful exercise of self-care during a tough time. In seasons of grieving, it offers a visual way to really dive into how I’m perceiving my life, and where I might want to take it from this moment forward. There are all sorts of difference Life Maps we could do. Some reflect on what you perceive to be your key life milestones. That could be defined as those life obstacles and significant successes that stand out to you in your own life story. While putting together this post, I came across a few nice examples of what a “Life Map” could look like. The picture below is something I actually added to my mental health-related Pinterest boards. 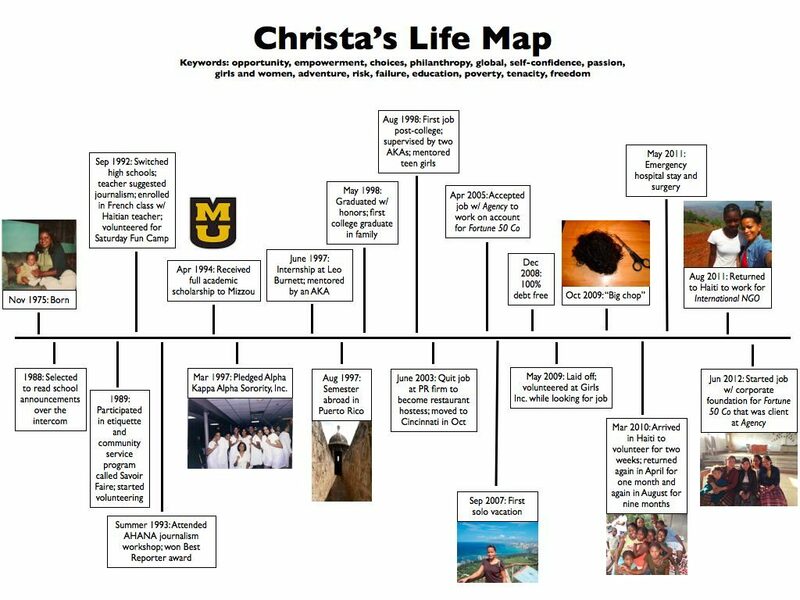 I have no idea who Christa is, but her Life Map appeared on both my Google and Pinterest searches, without any backlinks to where it came from. I haven’t been able to find Christa’s website online, so Christa, if you read this, please do contact me so I can properly reference you and give you a backlink. Other Life Maps spin-off from that idea, but with a more spiritual orientation. 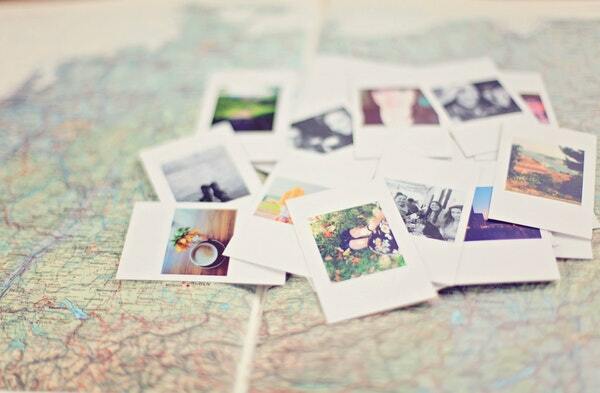 Specifically, a spiritually-oriented map might highlight the role of the Divine in your life. 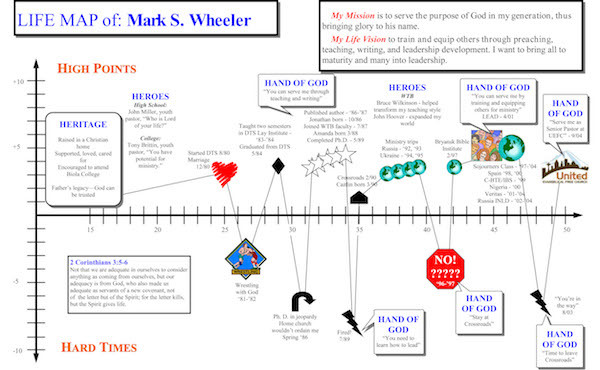 For example, you can see how Reverend Mark Wheeler highlights the “Hand of God” in key life events on his life map from a Christian perspective. Here’s another life map example from good ol’ Oprah, courtesy of life coach Cheryl Richardson. This one is created out of different physical materials and pasted together into a unique collage. You can use magazines, catalogues, extra flyers and brochures you have laying around, pieces of the bag carrying your Meow Mix for your cat or absolutely anything you wish. To be honest, I believe these are all fantastic. That’s because the most important part of doing a life map is the act of doing and creating; the key is the self-reflection process itself. Specifically, reflecting on how you’re currently perceiving your past influences how you’re living your present. As you “observe” this (through the actual “doing” of the Life Map), you give yourself a powerful opportunity to choose how you want to author your future. For me, the one I first learned to do was during an assignment for my Counselling Psychology class almost a decade ago. That’s the one I’ll be focused on here. To be quite honest, I haven’t done a full, complete one in a long while (though I’ve done outlines, and never got around to finishing them). But after some recent eureka moments about my life purpose, I realized that it was time to, once again, do the hard work of intentionally deconstructing the problematic story that I tell myself. While/After doing that, I could also begin re-constructing (or “re-storying” in narrative therapy approach), the more life-giving story I’d like to tell myself. The fascinating thing about a life map is that it invites us to observe and engage our own lives from multiple perspectives. It’s like being able to weave in and out of a birds-eye perspective and seeing the whole image of our life map in front of our eyes. By gazing into my past, present, and future, my reflections offer me an opportunity to remember and validate my identity formation, and intentionally reflect on who I was, who I am, and who I hope to be. A small disclaimer: Don’t be surprised if this life map makes you cry, smile, laugh, want to rip it apart, or inspire you with a gratitude for your life story (and all its ups and downs) in the deepest parts of your soul. It’s possible that you might feel all sorts of emotions while doing this. Of course, it also might not. Really, either way, is fine. Such is the power and unpredictability of a raw and honest exercise of self-reflection. So, here’s how you can do a life map too. To keep things simple, I’ll be providing instructions for life maps that you can do via drawing by hand. The first phase consists of 6 preparatory steps. Find those pens or markers or pencil and paper or notebook if you’re doing this on paper. Create time. Leave aside 30 minutes — 1 hour. You can always do less or more, but this is just a general guideline to thoughtfully reflect on the course of your life, its high and low points, as well as stable times. PART 2: BRAINSTORM & LIST EVERYTHING DOWN. 3. What might have been some Key Obstacles in Your Life? These could be challenges or obstacles that people might encounter when they take a trip or journey. Items on this list might include: stop signs, speed bumps, traffic lights, dead ends, detours, highways, tolls, rest stops, etc. For example, a dead end might represent a decision that did not yield the desired result. 4. What have been some Milestone Successes in your life? These are things that you might be proud of. For example, these might be the “green lights” of life, the serendipitous surprises, and whatever other life events make you happy. E.g. A green light might represent getting approval to move ahead. 5. Go ahead and just list out as many things as you can from your brainstorm. Include experiences that influenced your life and later successes, both positive and negative. A general rule of thumb is that we perceive significant life events at least every other year or so. For example, if you are 40 years old, you may have between 15 to 20 life-shaping shifts. 6. If possible, try to include both negative events as well as positive ones. But there’s not hard and fast rule to this. If you d notice yourself including more negative ones, do note that for your later reflections after you’ve finished drawing your life map. If you notice yourself putting in more positive ones, please also note this in your reflections too. 7. Imagine your life story as a novel. This is particularly helpful if you get stuck at any point. 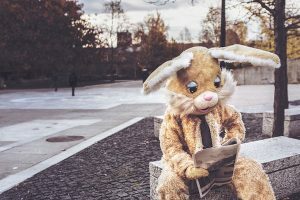 So, you can think of your life story (and life map) in terms of plots, themes, characters, and all the different factors that may have influenced who you are today. E.g. This might include your big decisions that took you on a new path, small choices that led to unexpected discoveries or realities, the impact of overarching historical events or politics in your life, important relationships, goals, beliefs, and even aspects of human behavior (fear, conformity, prejudice, etc). These are just some ideas–you don’t have to do all of these of course. Feel free to write as much or as little as you wish. 8. Try to put the events in chronological order. Note down your (approximate) age at the time of a given event. There are other ways to order the graph, but doing so by time is probably the simplest option for now. 9. Identify the positive and negative events. Place a “+” sign in front of events that are overall positive, and a “-” sign in front of ones that you perceive as overall negative– and then rate the positive or negative intensity of each event on a scale of 1 to 10, low to high. If it feels genuinely neutral, simply put in a “n” or a “0”. 10. Draw out the life map with above instructions in your notebook or digitally. If you’re feeling stuck or need a bit of help at any point, feel free to reach out to me. 11. When you’re done drawing the map, also feel free to take a break! What factors influence the choices you make? What factors help you move forward and make progress? What factors set you back? There’s a common metaphor that says “life is a journey”. Do you agree with this? If so, why? If you disagree, what’s another way to describe “life” that better resonates with you? If you wish, please write a journal entry or essay explaining what you have learned from this life map activity. Best wishes with this! As usual, feel free comment below if you’d like a hand with anything.